Celebrating 50 years in the structural steel industry in 2014! Shannon Steel came into being in October of 1964, the sole ownership of Nicolaas H. Schaafsma and was incorporated in 1968. It operated from a small workshop in the village of Caledon, fabricating miscellaneous items and bridge railings for the Department of Highways. Shannon Steel was given a “year supply contract” with this department for two years. Gradually Shannon Steel started to get involved in small buildings, specializing in service stations for a variety of Oil Companies. Approximately 10 to 15 of the first McDonald’s restaurants were fabricated and erected by Shannon Steel, when the “Golden Arches” moved into Canada. In 1976 the operation was moved from Caledon to Orangeville into a new plant and office building. By that time the company had established itself solidly in the building industry as a fabricator and erector of structural steel and open web steel joist. 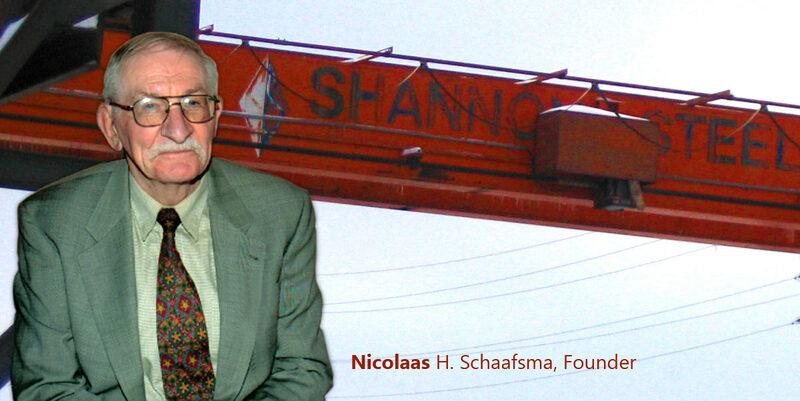 In early 2004 the president, Nicolaas Schaafsma retired and his son Mark Schaafsma took over company management. Shannon Steel has been involved in a variety of projects, ranging from schools to churches, as well as institutional buildings to factories and offices. Take a look at some of the recent projects Shannon Steel has taken on. Our mission at Shannon Steel Inc. is to satisfy our customers’ structural steel needs by supplying quality products on schedule and at fair prices. We strive to meet this goal through experience, integrity and competence. © Shannon Steel Inc. All rights reserved.